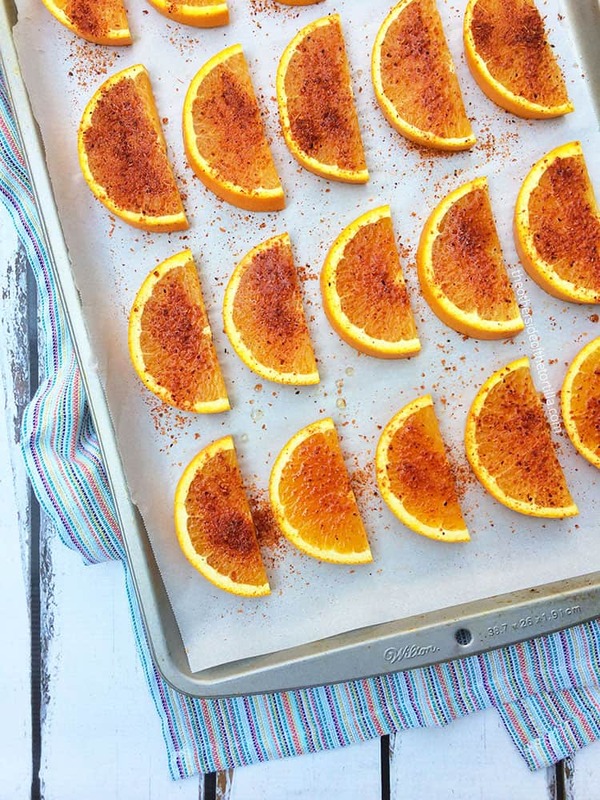 Transform plain orange slices with a little lime juice and Tajín! Serve immediately, or freeze them for a refreshing, frosty treat! The best part of summer is the peak availability of so many fruits; it means you can make a variety of sweet treats with little or no added sugar, such as street food-style mango and orange cups with coconut chips, watermelon aloe juice, and all kinds of paletas. With what seems like a surplus of juicy oranges at my local supermarkets, I’ve been using them in many different ways all summer. Whether it’s juicing them, eating them plain, or sectioning them to make a fruity pico de gallo or ensalada xec (a Mayan citrus and jicama salad), there are lots of possibilities. This healthy snack is one I like to make in advance, freeze and serve by the pool or in the backyard on hot summer days. It’s great to serve to kids as well because even if they eat two servings, they’re eating only one whole orange. Plus, it’s an easy snack for little hands to hold. This recipe is gluten-free, dairy-free and vegan-friendly. Bonus: If you cut a slit in the middle of the orange slices before you freeze them, you can also use them as a cocktail garnish or float them on top of a cocktail instead of an ice cube! They’d go great with a mangonada blended with a little tequila, any citrusy margarita or even as a garnish alongside a caballito of tequila. Slice the oranges and cut each slice in half. 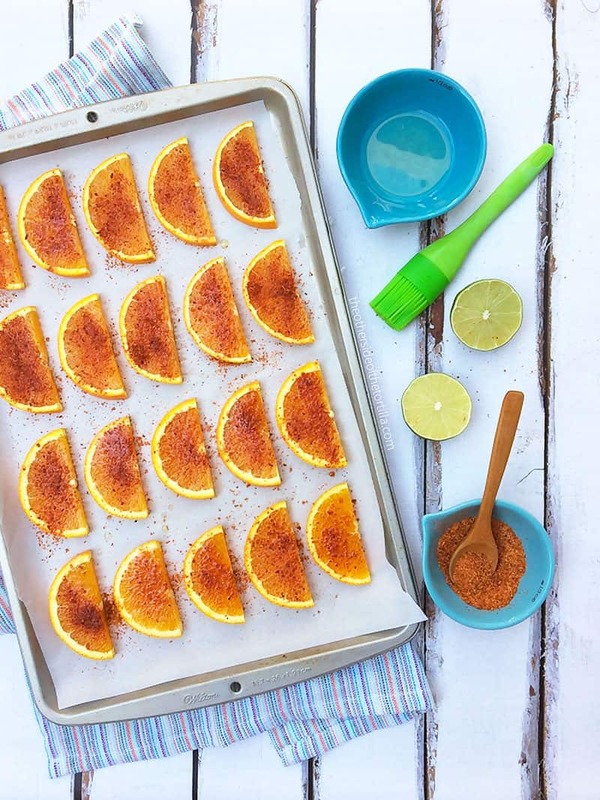 Arrange on a lined baking sheet or tray that will fit in your freezer. Squeeze the juice of half a large lime over the orange slices. If you like, you can squeeze the lime juice into a small dish and use a pastry brush to evenly apply the lime juice. 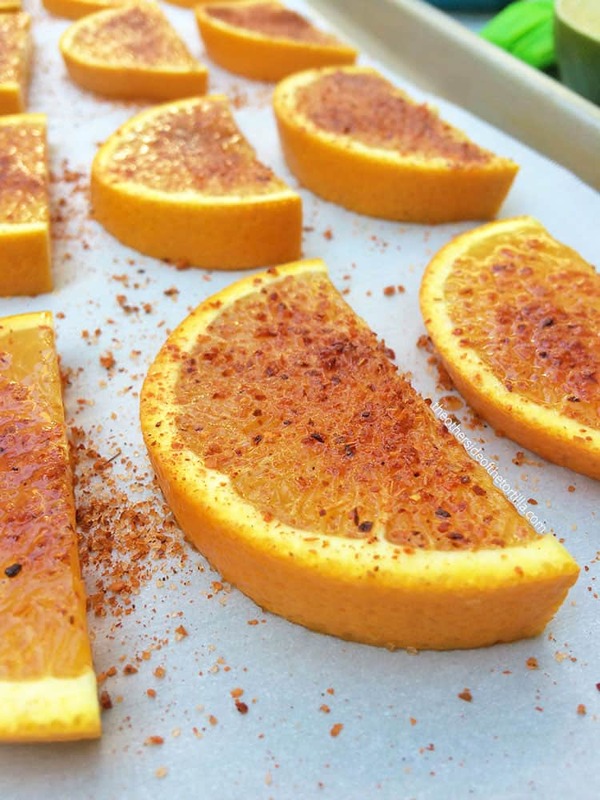 Sprinkle the Tajín liberally over the orange slices. Serve immediately or freeze for at least 30 minutes for a frosty sweet and spicy treat. Cook time listed is for freezing time. This looks delicious!!! I can’t wait to try it out!! I have a boat party next week that I am going to try and make these for. I’m excited! Thanks for sharing!